The Magnet Manufacturing Database keeps track of the properties, reports and certificates associated with each step of the magnet manufacturing process, simplifying the work of the Domestic Agencies and their suppliers and providing the traceability and transparency that are required by ITER Organization quality procedures. The first inputs into the Manufacturing Database for magnets were cleared by the ITER Organization in October—an important milestone on the road to magnet production. The release concerns the acquisition of raw material (18 HTS tape unit lengths) for the fabrication of HTS current leads, the components that will transmit current from room-temperature power supplies to very low-temperature superconducting coils. 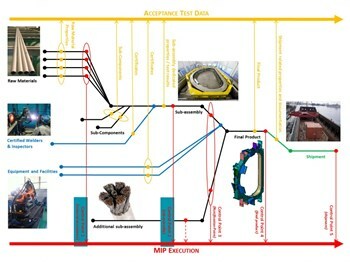 Raw material acceptance is just the first in a long series of control points, or "hold points," that are part of the specifications included in every Procurement Arrangement signed between the ITER Organization and the Domestic Agencies. The traceability of each one of these steps, and the quality assurance and quality control (QA/QC) documents that go with them, must be ensured during the fabrication of the ITER magnets systems—not only the coils, but also the feeders, magnet supports and instrumentation. Thanks to an in-house collaboration between the ITER Magnet Division and the Project Information System Section (IT), a web-based application under development since 2012 is now available to monitor the magnet Procurement Arrangements as well as the contracts concluded directly by the ITER Organization. "Building on the success of the Conductor Database that enabled the efficient monitoring of strand/cable/jacket/conductor production," explains Arnaud Devred, section leader for Superconductor Systems & Auxiliaries, "we have developed a Manufacturing Database for the other magnet Procurement Arrangements underway and the direct contracts for magnet instrumentation." "The idea is to simplify the work of the Domestic Agencies and their suppliers, and provide the traceability and transparency that are required by ITER Organization quality procedures. By centralizing the data and the documents needed for clearing each hold point, and by storing the information in a user-friendly manner, we eliminate innumerable paper and email exchanges." The Magnet Manufacturing Database (see schema) keeps track of the properties, reports and certificates associated with each step of the manufacturing process. Technical information on raw materials, records on procedures such as welding and testing, inspection certificates, final product documentation and shipment information can all be stored and accessed in the database. Implementation of the database was premiered in China and for some of the magnet instrumentation contracts. "We hope that it can be deployed in the same collaborative manner for all magnet fabrication," stresses Arnaud. Outside of the Magnet Division, other ITER Organization groups have shown interest in the Manufacturing Database as a model for monitoring complex Procurement Arrangements.